All transactions are safe and secure with a reliable history in online purchasing behind each of our associates. Buy the Saw 6 Carousel t-shirt to own Saw clothing and merchandise. If Saw 6 has your blood racing, then hop on the carousel with this classic black Saw t-shirt. It is sure to set your mind spinning and catch the attention of your friends. Despite the deaths of Jigsaw and his protégé Amanda, his twisted tests continue to unfold. He soon finds another disciple to do his bidding. 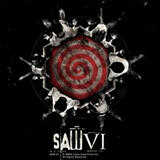 Wear this Saw VI tee as you play in your pig mask with your Jigsaw puppet and dolls. In addition to the Saw 6 Carousel tee above, browse the Saw Clothing Gallery for more apparel like men's and women's clothes, kids shirts or hoodies.